Hidden Pond: This 60-acre woodland property, located about a mile from Goose Rocks Beach and five miles from the charming town of Kennebunkport, offers a unique blend of grown-up luxury and sleep-away-camp nostalgia. Opened in 2008 with 14 individually designed two-bedroom cottages – set amid rustling birches, fragrant balsams, and a tranquil pond as if in a perfectly planned miniature neighborhood – the resort has added a dash of romance this summer with a trio of new additions. Most notable are 20 new luxury one-bedroom bungalow cottages (shown at right), featuring king beds and floor-to-ceiling stone fireplaces that make them ideal for couples (there’s also a nearby adult-only pool). The second appealing addition is Earth, a “farm-to-fork”-inspired restaurant by James Beard Award-winning Boston chef Ken Oringer. Dine inside at distressed wood tables lit by copper lamps and towered over by a cut-log wall and tree branches dotted with pin lights or outside on a gardenlike terrace spiked with flaming torches and overlooking a pond with a bonfire at the far end. 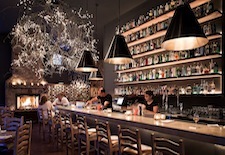 The ambience is convivial (especially at the bar, shown below at left) with jazzy music and lively conversation – until the food starts to arrive and quiet gasps of satisfaction are heard all around. Most of the ingredients are local, but prepared with a distinct Mediterranean influence (for example, the Taste of Earth appetizer features several small dishes based on vegetables grown in the property’s organic garden but accented by prosciutto, shrimp ceviche, and liver paté). And don’t overlook the fried clams with garden tartar, which were oh-so tender. This being Maine, Earth offers a wood oven roasted whole lobster with green curry butter and grilled lemon, but you may want to opt for the seafood paella with herbs and garden peppers, which was outstanding (dinner for two, from $140). The third new addition is the Tree Spa, a trio of raised wooden tree house treatment rooms connected by a catwalk. Like Earth, the spa draws its inspiration from the fresh herbs in Hidden Pond’s garden. The property’s nightly bonfires, meandering hiking trail, twice-weekly watercolor painting classes and red-and-white 1956 Ford Country Sedan Station Wagon (nicknamed Bessy and used to ferry guests to the beach and back) all create a feeling of comfort and nostalgia – which is exactly what Maine is all about, from $425/night. (shown at right) debuted over Memorial Day weekend with 21 bright but cozy rooms, all in teal or coral hues with white accents, and more spacious suites as well as a stellar restaurant helmed by Chef Bryan Dame. Painted a cheery yellow on the outside, with a large front porch lined with comfy rockers, The Tides Beach Club takes an old-school framework (the inn dates to 1899 and Teddy Roosevelt was once a guest) and infuses it with modern panache, especially on Thursday to Saturday nights when the lobby/lounge and restaurant bar, with its tufted leather detailing and groovy Lucite stools, buzzes with a mix of guests and locals. With Goose Rocks Beach just across the street, complete with chaises, umbrellas and beverage and lunch service, it’s ideal for social couples who like to be right on the water, while Hidden Pond guests can enjoy the beach, have lunch or dinner, and then head back to their seclusion in the woods. Chef Dame’s classics-with-a-twist menu is local seafood-focused (although burgers and steaks are in ample supply) and the lobster roll (shown at left) is a must-try. On the lighter side are salads, such as the Maine-raised tomato salad with red onion, pecorino, and olive oil, and the pickled watermelon and local feta cheese with a mosaic of lettuces. Lunch for two from $50, rooms from $325/night. 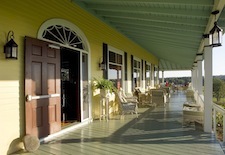 Chebeague Island Inn: If you revel in historic ambience and prefer reading a good book on a 100-foot-long porch (shown at right) or in front of a roaring fireplace to watching TV, check out this 21-room Greek Revival-style inn, located on Chebeague Island, a 15-minute ferry ride from Cousins Island in Yarmouth. Built in 1920 as one of about 100 wooden inns that once dotted the islands of Casco Bay, it is one of only a few that remain. New owners Casey Prentice and his parents have recently given the second and third-floor rooms a bright, cheery freshening up (white-washed plank floors, white walls, crisp linens with blue and red accents atop wrought-iron beds, shown below at left) while maintaining the wood-beamed ambience, creaky staircase, and retro comforts of the Great Room, Restaurant, and porch. The inn’s age means noise does travel, and there are no air-conditioners, TVs, or phones in the rooms (none of them even necessary in this setting), but there may be a friendly handyman-turned-ghost named Charlie in residence. The water faucet in our bathroom was inexplicably turned on full-force in the middle of the night, and when I told the front desk what happened, that’s when I heard about Charlie. But the man you should care most about at Chebeague Island Inn is Chef Justin Rowe (formerly of the White Barn Inn), whose dinner menu seduces with hearty yet nuanced fare such as pan-seared halibut chowder and pan-roasted Long Island duck breast with sour cherry basmati rice and braised Napa cabbage in an orange and ginger reduction (dinner for two, from $95). Add in L.L. Bean beach cruiser bikes, a croquet and badminton lawn, and golf links, and the whole experience is a throwback to simpler times when shooting the breeze over a cool drink at sunset was what a Maine vacation was all about; rooms from $285/night, including an à la carte breakfast. 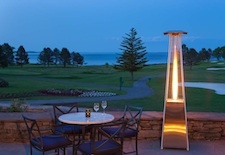 Samoset Resort: A striking, $3 million transformation of rooms and public spaces at this 230-acre, 178-room waterfront resort on the Rockland/Rockport town line has given it added romantic appeal – especially for couples who golf. 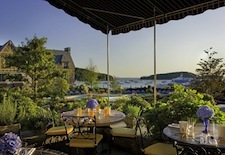 Although wildly popular with families (as well as a top spot in the area for weddings and conferences), Samoset’s 2011 addition of a full-service spa and an indoor-outdoor dining and lounge area with seating around atmospheric fire pits offering fabulous views of the golf course and Penobscot Bay (shown at left) is a haven for grown-ups. The new restaurant, La Bella Vita Ristorante and Enoteca Lounge is the place to savor classic Italian specialties made with fresh Maine ingredients in either a formal restaurant or casual lounge setting (Enoteca has an antipasto bar and wood-burning pizza oven for guests who want to nibble on small plates – the mushroom truffle pizza is amazing – while sipping a glass of wine). But don’t miss a multicourse meal in La Bella Vita, where dishes such as mushroom risotto and veal scallopini are prepared with exceptional expertise, and generous desserts, such as tiramisu and blueberry pie à la mode (this in Maine after all), are worth saving room for. Afterward, sip nightcaps near one of the fire pits as the moon rises over the bay. Golfers can head to the scenic 18-hole course that hugs the bay, while couples looking to shop or browse local galleries can visit nearby Rockland or Camden. If you simply want to relax in the sun, then choose a chaise at the Splash Pool Deck. 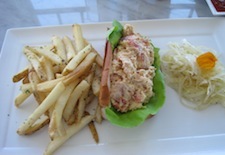 Lunch options include lobster rolls (of course), salads and burgers at the Splash Pool Bar or the Clubhouse Grille. 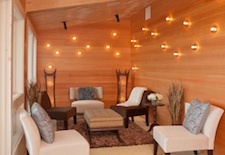 Late afternoon is the perfect time to head to the new Spa at Samoset with its four treatment rooms (including one for couples) and inviting relaxation lounge (shown at right), for a Blissful Stone Retreat or a Coastal Sugar Scrub. All accommodations have a private balcony, while those located in the Deluxe Wing are newly renovated (carpet, bedding, furniture, glass shower). For added privacy, there are also three new cottages overlooking the golf course and bay, as well the just-renovated Flume Cottage set all by itself at the water’s edge. 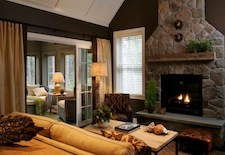 Rooms from $299/night, cottages from $750/night. Harborside Hotel, Spa & Marina: After the scenic drive up Maine’s coastal Route 1 to Bar Harbor and a loop drive through stunning Acadia National Park (where energetic couples can also bike or hike), you’ll want to settle in front-and-center in town and simply enjoy the view. The best spot to do that is this 187-room resort (a sister property to Samoset) sprawled along the water just steps from Maine Street and the pier. With its neat stone exterior and balconies dripping with summer blossoms, Harborside has a classic ambience, which is even more evident when you see the blazing fireplace in the intimate wood-paneled and sofa-lined lobby. 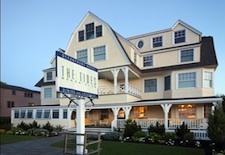 All rooms and suites are spacious and recently renovated and feature a private balcony with a harbor, island or sunset view, and classic New England floral décor. The main pool and Jacuzzi are located just off the charming La Bella Vita restaurant’s outdoor patio (shown above at left), but guests can also head over to the adjacent Bar Harbor Club, where another pool and Jacuzzi await, as does the Pool House bar and restaurant and the Spa at Bar Harbor Club. Just a few yards farther, you can walk or drive across a wide sandbar to Bar Island at low tide – just be sure to get back to town before the water starts to rise again. 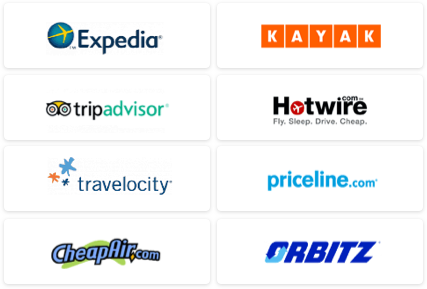 Rooms from $299/night. 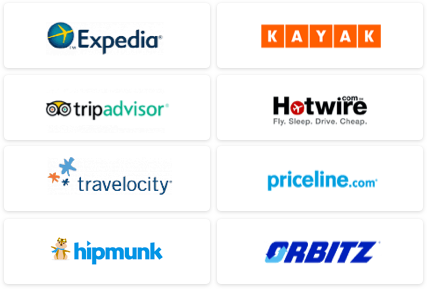 See our Maine Travel Guide for more trip-planning information, then use our Travel Search price comparison tool to find the lowest rates on flights, hotels, packages and more travel deals.